This week's SmackDown Live is the third SmackDown after Royal Rumble 2019 on Jan. 27, 2019! Press F5 or refresh for updates during the show. Smackdown opens with a replay of Vince McMahon inserting Charlotte into the Wrestlemania main event. Charlotte then hits the ring. "Since day 1, I told you that this was my destiny! And I really want to tell you that my heart breaks for Becky, but it doesn't. Becky! Becky! Becky! Her replacement. You know what? I thought I taught her better than that, to be dumb enough to get suspended. I want to tell her that, but here we are, just like at Survivor Series, when she attacked the Superstars of Raw, got injured, dropped the ball. You know who she picked? She picked me. So the myth of the Man could continue, and the queen could go to battle. No one wants to admit it, but I am the backbone of this division, the franchise. Everyone thinks that Vince McMahon chose me because I'm his favourite, but that's not why. He made a smart decision. He picked a future Hall of Famer after someone who's had a few good months. Mr. McMahon chose me because the main event of Wrestlemania is the biggest match of the year, and you're not going to risk it on a flash in the pan like Becky Lynch. So you may not be happy with Mr. McMahon's decision, but I promise you this: Wrestlemania will be like every other PPV I've main evented, you're all going to be on your feet chanting, 'This is awesome!' So boo me now, you're welcome. And I want to dedicate this history-making Wrestlemania main event victory that I'm going to have to my best friend, Becky Lynch. Woo! Oh, and by the way, Ronda, I have a front row ticket to your match on Sunday against Ruby Riott. Don't worry, I'm just here to watch. I promise I won't interfere. But I may have a new Wrestlemania opponent. Who knows?" Later tonight, the competitors in the WWE Championship Elimination Chamber match will face off in a gauntlet match for the right to enter the Chamber last. This match will include a member of The New Day in place of the injured Mustafa Ali. Backstage, The Iiconics cut a promo about how hard they've worked and how long, and how great it would be to win the match. Mandy and Sonya talk about how many historic matches they've been in. Carmella and Mandy start off, trading rear waistlocks, Mandy with an elbow, Sonya in, whip, double boot to the gut, take turns giving knees, throw down for two, Carmella with a front facelock, Naomi in, double team suplex for one, hammerlock, Sonya tosses Naomi to the corner, shoulder tackles, Naomi with a boot, Sonya presses her to the apron, Naomi with a kick to the chest, splits leg drop for two, arm wrench, Carmella in, suplex, blocked, Sonya with knees,snapmare, blocked, Carmella with a head scissors, Naomi in, Mandy in, tries to run, goes to tag one of the Iiconics, they drop off the apron, she continues to run, Carmella blocks her, Naomi with a suicide dive, commercial. Back on air, Sonya has Carmella in a body scissors, Carmella powers out, mutual crossbody, Carmella drags Sonya to the corner for a tag, Mandy knocks Naomi off the apron before Naomi can tag in, drags Sonya, double tag to partners, Naomi with a crossbody, forearms, jaw breaker, Disaster Kick, forearm to Sonya, tosses her to the apron, Carmella with a superkick, Naomi with a split-legged moonsault for three. The Iiconics attack the winners after the bell. On WWE.com last night, Bayley said Sasha has more passion than anyone else in the business, and she knows Sasha will be there on Sunday. Nia Jax and Tamina say no other team will walk out, and that, even if they all gang up on the two of them, it won't work. The Riott Squad say they have stronger loyalty than other teams. Mustafa Ali bemoans his body giving out and not allowing him to compete on Sunday, but vows to come back stronger than ever. McMizTV is set up in the ring. Miz: "Feels like they're ready. Are we ready? Welcome to the most must-see talk show in WWE history, welcome to-- (crowd chants 'MizTV!') Close!" Miz: "That's teamwork. The Usos had a message to send to us last week, while I was off on a photo shoot, and Shane-- No, let's tell 'em. Shane will be in NCIS LA!" Shane: "What did I tell you?" Miz: "Don't tell anyone but family. But we're all family!" Shane: "Let's welcome our guests, who are also our opponents this Sunday, The Usos!" Shane: "Welcome, have a seat!" Usos: "We think we just gonna stand right here. Nah, nah, show some respect, we've got the best tag team in the world. Or is it? Because the message is the same, we got a tag team in front of us trying to be the Usos!" Shane: "We're not trying to be the Usos, but we are the best tag team in the world." Usos: "You guys ride together? Train together? Eat together? One of you get injured, what do you do? You know what? Let's give them a tag team test." The Usos take turns asking each other personal questions. Shane and Miz do the same thing, but with Miz whispering the answers in Shane's ear. Miz says his favourite food is quiche. Jimmy: "We ain't talking about Maryse, and we ain't talking about my daddy, 'Kish." Miz: "Should we be talking about Mandy Rose?" They get in each others' face. Shane: "It's gonna be like this? Let's put this twin thing to the test, maybe I'll slap you so hard your brother will feel it." Miz: "Come on, let's do it in the ring on Sunday. This Sunday, how about--"
Jey slaps the mic out of his hand. Jey: "Why don't you do us all a favour and shut the hell up! This Sunday, you're going to be in the ring with a real tag team, one who have been down since Day 1, the Usos!" They start to leave, but then stereo superkick the tag team champions. After a commercial, Daniel Bryan hits the ring with Rowan. "You know, there are a lot of people here who want me to lose my WWE Championship this Sunday at Elimination Chamber. But the truth is, you're lying to yourselves, because you are all fickle. 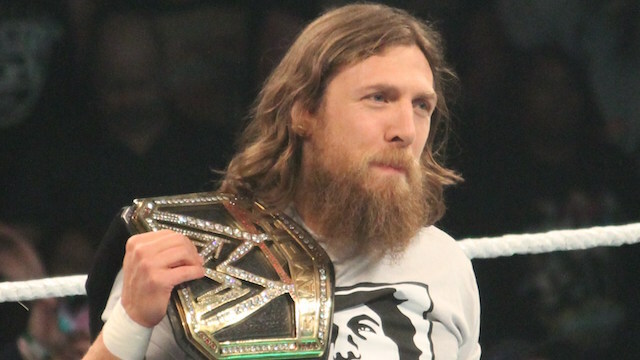 And you need somebody like the new Daniel Bryan to show you how to live your pathetic lives. You need me as WWE Champion. Now listen, I do not want to participate in the Elimination Chamber match, because it is painful, it is horrible, and it will likely shorten my career. But, you see, I have to sacrifice. Now I don't want any of you people to call me a martyr. But my sacrifice is necessary. It is necessary for me to win the Elimination Chamber and stay the WWE Champi--"
The New Day interrupt. They tease which one it's going to be, then send Kofi to the ring. Lockup, break. Bryan with a side headlock, shoulder tackle, side headlock, snapmare, keeps the hold locked in, transitions to a bow and arrow, Kofi reverses into a cover for two, Bryan to the floor, slowly rolls back in the ring, Kofi with a rear waistlock, Bryan reverses into an armbar, wrenches an arm, Kofi rolls through, kips up, takedown, Kofi with an armbar, Bryan presses him to the corner, punches to the gut, European uppercut, whip, Kofi floats over, arm drag, another for one, armbar, knee drop to the arm, chinlock, keylock, Bryan presses to the ropes, punch to the gut, whip, knee lift, whip, knee lift again, whip, a third knee lift, knees to the back, wrenches the face, surfboard stretch, both men's shoulders down for two, Kofi with a whip, Bryan with a tackle, Kofi with a heel kick for two, tosses Bryan to the floor, suicide dive, commercial. Back on air, Bryan is posing in the ring as Kofi lays near the ropes, cover for two, chokes Kofi in the ropes, dropkick to the back, Kofi with kicks, punches in the corner, Bryan with an arm wrench, avalanche suplex onto the top rope, kicks to the gut, goes up top, knee drop to the back of the head for two, goes up top, misses a diving headbutt, Kofi with a clothesline, another, dropkick, leaping clothesline, Boom Drop, somersault senton for two, whip, Bryan floats over, Kofi with a kick to the gut, top rope crossbody for two, Bryan drop toeholds Kofi into the bottom turnbuckle, sets Kofi up top, tree of woe, roundhouse kicks, baseball slide for two, sets Kofi up top again, back superplex, Kofi turns around and lands on Bryan's face, commercial. Back on air, Bryan releases a hold and they trade chops, then European uppercuts, Bryan with headbutts, roundhouse kicks, connects with the last one for two, back suplex, blocked, Kofi with a hurricanrana, reversed into a rollup for two, trading rollups for two, Bryan goes for the Yes Lock, locks it in, Kofi makes it to the bottom rope, break, Bryan with a baseball slide, running knee from the apron, rolls Kofi into the ring, goes up top, diving headbutt, reversed with a dropkick, calls for Trouble in Paradise, Rowan trops him, E and Rowan brawl, Woods with a baseball slide to Rowan, New Day ejected, Bryan with a rollup for two, tosses Kofi to the corner, roundhouse kicks, whip, Kofi with a swinging kick, Rowan pulls Kofi to the floor, tosses him into the timekeeper's area, the ref misses this but catches the aftermath, ejects Rowan, Bryan rolls Kofi into the ring, running knee reversed into Trouble in Paradise FOR THREE! Fall begins during commercial. Back on air, Jeff escapes an armbar, elbow to the back, Kofi tosses Jeff to the floor, misses a suicide dive from the steps, Jeff with an avalanche into the barricade, goes up top, misses a Swanton, whips Kofi, hits a clothesline, inverted atomic drop, leg drop, dropkick, reversed into a rollup for two, Jeff with a dropkick, dropkick to the back of the head in the corner, goes up top, Jeff with a punch, another, goes up top, superplex, blocked, Kofi with punches, Jeff climbs back up with a punch, superplex, blocked, Kofi with punches, knocks Jeff off the top rope, crossbody, reversed into a rollup for two, Trouble in Caradise, blocked, hits an SOS instead for three. Fall begins during a commercial, back on air Kofi is punching Joe, Joe hits a headbutt, forearm, Kofi with a European uppercut, boots, punches, kick, whip, reversed, Joe with an elbow, pele kick for two, knee, abdominal stretch, clothesline for two, headlock, crossface punches, Kofi tosses him to the floor, suicide crossbody, both men back in the ring, Joe with a clothesline for one, Kofi with punches, Joe with an inverted atomic drop, snapmare, bow and arrow hold, Kofi flip-kicks his way out, Joe with a running senton splash for two, Kofi to the apron, punches, springboard, Joe shoves him to the floor, Kofi rolls back into the ring, Joe wrenches his neck, Kofi to his feet, punches, dropkick, leaping clothesline, cover for two, Joe locks in the Coquina Clutch, Kofi rolls it into a rollup for three! Joe hits an uranage on Kofi, then locks in the Coquina Clutch on the floor, until referees try to pull him off. AJ Styles runs out to make the save, and beats Samoa Joe back. Commercial. AJ waits the entire length of the commercial break to allow Kofi to make it back into the ring. He tries to tell Kofi that he doesn't have to do it, but Kofi insists otherwise. He pie-faces AJ and says he's been waiting too long. He forearms AJ, who responds with punches, stomps in the corner, backbreaker for two, clothesline for two, Kofi with punches, AJ with a clothesline, wrenches a leg, keeps wrenching the leg, Kofi makes it to the rope, punches, AJ with a punch, Kofi crumples, AJ with a snap suplex for two, drags Kofi up, suplex, reversed, Kofi with a rollup for two, another rollup for two, backslide for two, AJ with a backbreaker, whip to the corner, Kofi presses AJ to the apron, punches, dropkick to the leg, follows to the apron, roundhouse kick, another, charges, AJ dodges, Kingston goes knees-first into the ring post, beats the count at 9, AJ with a whip to the corner, avalanche, goes up top, hurricanrana, blocked, Kofi hits a top rope crossbody to the back for two, SOS, reversed into a Calf Crusher, Kofi taps. Big E and Xavier Woods run down to help Kofi off, as the audience gives him a standing ovation. Orton enters the ring from the back and hits an RKO on the waiting AJ for three.